PT Angkasa Pura II (Persero) - Angkasa Pura II or referred to as "Angkasa Pura 2 Group" is a reputable state-owned airport management services company in Indonesia. Angkasa Pura 2 Group engaged in airport services and airport-related services. Angkasa Pura 2 Group is completely owned by the government of Indonesia. Based in Jakarta, Angkasa Pura 2 Group conducted business operations in western parts of Indonesia under the management of 13 branch airports. The Company's airports consist of Soekarno-Hatta International Airport Jakarta, Halim Perdanakusuma International Airport (Jakarta), Husein Sastranegara International Airport (Bandung), Kualanamu International Airport (Medan), Supadio International Airport (Pontianak), Minangkabau International Airport (Padang), Sultan Mahmud Badaruddin II International Airport (Palembang), Sultan Syarif Kasim II International Airpot (Pekanbaru), Sultan Iskandar Muda International Airport (Banda Aceh), Raja Haji Fisabilillah International Airport (Tanjungpinang), Sultan Thaha Airport (Jambi), Depati Amir Airport (Pangkalpinang) and Silangit Airport (Tapanuli Utara). 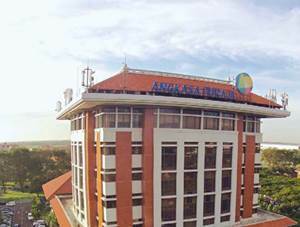 PT Angkasa Pura II (Persero) was first established in 1984 and initially registered as Perum Pelabuhan Udara Cengkareng. The name of PT Angkasa Pura II (Persero) officially launched in 1993. As of December 2016, PT Angkasa Pura II (Persero) has 3 subsidiaries and 3 affiliated companies, namely PT Angkasa Pura Solusi (99% shares ownership), PT Angkasa Pura Kargo (99%), PT Angkasa Pura Propertindo (99%), PT Railink (40%), PT Gapura Angkasa (31.25%) and PT Purantara Mitra Angkasa (0.134%). In term of financial performance, Angkasa Pura 2 Group posted positive financial performance in 2015. According to PT Angkasa Pura II (Persero) Annual Report 2015 as cited by JobsCDC.com, Angkasa Pura 2 Group managed to record revenue of Rp 6.64 trillion in 2016, an increase of 17.75% from the previous year of Rp 5.64 trillion. Total net profit in 2016 continue to grow by 14.99% to Rp 1.9 trillion from Rp 1.68 trillion in 2015. Male or Female, maximum age of 25 years old. S1 Statistics, Law, Management (Finane, Business, and Human Resources), Communication Science, Accounting, Psychology, Industrial Engineering. Minimum GPA of 3.00 (on a 4-point scale). Have TOEFL score at least 450. Well behaved and never engage in criminal activities stated by Police Note Certificate (SKCK). Able to operate Microsoft Office (Ms Word, Ms Excel, and Ms Power Point). Willing to be placed in all working areas of PT Angkasa Pura II (Persero). Following all the selection stages. Male or Female, maximum age of 30 years old. Education background in S1 Business Management. Minimum 2 years of experience, preferably in the field of organizational structure consultant. Preferably fluent in English both oral and written. Previous experience in analysis of the company's portfolio business. JobsCDC.com now available on android device. Download now on Google Play here. Please be aware of recruitment fraud. The entire stage of this selection process is free of charge. PT Angkasa Pura II (Persero) - D3, S1 Graduate Development Program AP 2 Group September 2017 will never ask for fees or upfront payments for any purposes during the recruitment process such as transportation and accommodation.